Working together, through gifts large and small, we will ensure that our students continue to thrive as part of an exceptional SMS education. By investing in Syringa Mountain School, you are investing in a future of eco-literate, compassionate, critical thinkers ready to change the world for the better. As the next generation of public school choice in Idaho, Syringa Mountain School provides a rigorous, arts integrated Waldorf curriculum within the Blaine County Public School system. 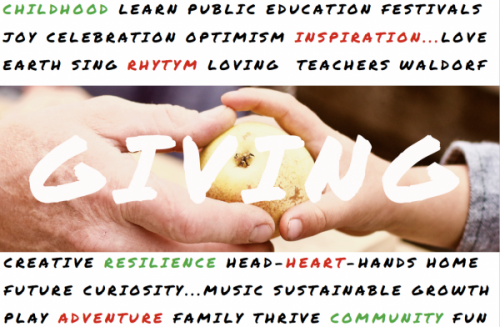 Syringa Mountain School is a 501(c)(3) non-profit entity, Tax ID # 35-2450616. In addition to state and federal tax deductions, Idaho recently established a 50 percent tax credit (for those who itemize) for donations to educational institutions such as Syringa Mountain School. With a 50 percent state tax credit plus federal deductions, the true out-of-pocket cost of your gift may be a fraction of your donation!